The budget presented by Ontario Finance Minister Charles Sousa in July projected a deficit for the seventh year in a row. The province faces difficult choices in order to return to balance. On several occasions Federal Finance Minister Joe Oliver has worried publicly that Ontario’s fiscal position could undermine the country’s economic recovery. However, the federal government has yet to acknowledge its own contribution to making Ontario’s fiscal situation much worse, instead pointing to the overall increases in transfers to provinces. Here are five ways that decisions by the federal government contribute to the provincial deficit. 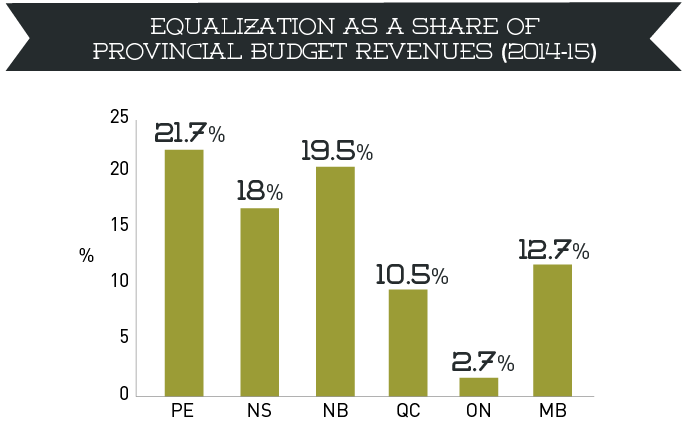 The Equalization program is worth nearly $17 billion in 2014. Through Equalization, the federal government provides financial support to provinces with below average fiscal capacity—a group that has included Ontario since 2009. Of that nearly $17 billion, Ontario is receiving $2 billion this year. Even taking into account this payment, Ontario residents still make a net contribution of $3 billion to the governments of other provinces under the current Equalization formula—despite the fact that Ontario has below average fiscal capacity. Without this redistribution away from Ontario, it would be easier for Ontario to raise revenues and spend them within the province. The program redistributes funds away from Ontario rather than toward it, even though Ontario has below average fiscal capacity. This is a perverse outcome and not the intention of the program. This perverse redistribution is due to the fact that natural resource royalties are not available for redistribution but are included in calculations of fiscal capacity. It leaves Ontarians on the hook to fund inter-regional distribution due to surging resource royalties from which the province does not benefit fiscally. The program is simply not designed for sustained commodity booms. The first year that Ontario became eligible to receive Equalization payments, the federal government made a sudden change to the program that coincidentally lowered the transfer to Ontario, called the “GDP cap”. 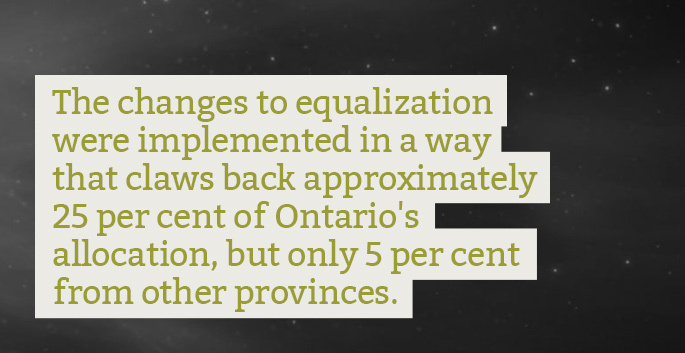 According to Quebec’s Department of Finance, this change to the Equalization formula has cost the Ontario government $6.6 billion in the five years since it was implemented in 2009. The changes were implemented in a manner that claws back approximately 25 per cent of Ontario’s allocation, but only 5 per cent from other provinces. The federal government has also made changes to its largest transfer payment to provinces. At $32.1 billion in 2014, the federal government’s contribution to the cost of public health care, the Canada Health Transfer, is the largest federal transfer payment. In 2014, the federal government changed how this money is distributed among the provinces. The change means that in the future each province will get a share equivalent to its share of the population. This is perfectly reasonable. 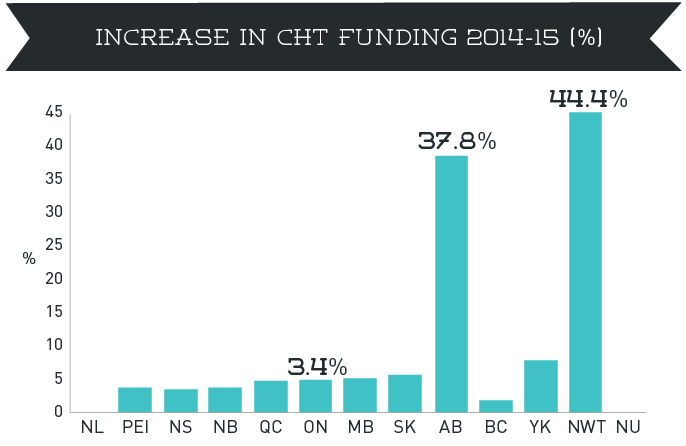 But in this transition year Alberta’s new increase is taken from the allocations to other provinces. While the overall pool of funding increases by 6 per cent this year, Alberta is seeing a 37.8 per cent increase and Ontario is seeing only 3.4 per cent. This was avoidable: when a similar change was made to the Canada Social Transfer in 2007, the federal government added one-time transition funding to make sure that Ontario’s new boost at the time did not come from the allocations to other provinces. Finally, in a year when the Total Transfer Protection program would have provided Ontario with $641 million to buffer against the losses from Ontario’s Equalization program, the federal government quietly withdrew the program. The program has provided $2.2 billion to seven provinces since 2009. Because Ontario is the only province that would have been eligible for a payment this year, ending it hurts the balance sheet of no other province this year. As a recent Mowat Note outlined, the federal government has implemented or is considering a number of tax measures with significant fiscal impact for provinces. Federal-provincial tax collection agreements were signed over the past several decades to simplify tax filing for individuals and businesses, reduce administration costs, and forge a stronger economic union. In exchange for the federal government’s collection and administration of taxes through the Canada Revenue Agency, provinces (except Quebec) agreed to mirror the federal definition of “taxable income” in their own income tax legislation. As a result, the federal government’s introduction of pension income splitting in 2007 and Tax-Free Savings Accounts (TFSAs) in 2009 cost the Ontario government $250 million and $110 million respectively in 2013. The Conservative Party of Canada’s 2011 election platform committed to introduce family income splitting for couples with dependent children and double the annual contribution limits for TFSAs to $10,000. These measures are expected to be introduced in the 2015 federal budget. Family income splitting is expected to cost the Ontario treasury over $1.1 billion per year. Doubling the limits for TFSAs could, in the longer-term, cost provinces billions of dollars more. These changes were made (or are being considered) without consulting provinces or providing them with compensation for lost revenue. The provinces signed tax collection agreements to rationalize roles and responsibilities between the two orders of government and to save governments, households, and businesses time and money. The agreements now act as straitjackets that compel provinces to go along with federal policy choices at significant costs to provinces at a time that they can ill-afford them. Ontario’s bottom line has also been hit in recent years by an emerging federal pattern of indirect downloading, either by creating new programs with significant costs for provinces or by walking away from important programs and leaving provinces with the fallout. The 2012 Safe Streets and Communities Act (known as Bill C-10), for example, increased the use of mandatory minimum sentences and the effect increased costs to provinces and territories for court cases, incarceration, and parole reviews. The Parliamentary Budget Officer estimated these increased costs to Ontario at $40 million annually. When the federal government ended the At Home/Chez Soi program, Ontario stepped in to continue housing subsidies for individuals with mental health challenges who otherwise would have been left in the lurch; Ontario has been left to pay for scientific research in the Experimental Lakes Area after the federal government walked away; and the provinces is also dealing with the federal moves to download health costs for refugee claimants and for RCMP officers. The federal government doesn’t directly deliver many government programs anymore. Instead, fiscal transfers account for two-thirds of the federal budget. But many of those large transfers shortchange Ontario. The new Building Canada Fund is the 10 year, $14 billion federal infrastructure program. Over 10 years, a part of this program will provide $250 million to each province and territory, regardless of population or need. To put that in perspective: Ontario, home to nearly 14 million people, will receive the same amount as PEI and its 150,000 people. The result is that Ontario, with 39 per cent of the Canadian population, will receive about 28 per cent of federal infrastructure spending, or almost a billion dollars less than if the program were distributed on a per capita basis. In another case, Ontario receives 34.5 per cent federal funding for social and affordable housing. That translates to about $84 million less than it would on the basis of population, or $156 million less than it would based on Core Housing Need, commonly used by Canadian governments to measure affordable housing needs. The Labour Market Development Agreements provide $2 billion for training and job search support for unemployed Canadians. The programs are funded federally from EI and delivered by provincial governments. Because of a formula based on the job market in 1996 when this program was introduced, Ontario receives 29 per cent of federal funding—$185 million per year less than it would if the program was based on current population share, or $256 million per year less than if the funding matched the province’s current job market. Taken together, federal under-funding of programs in Ontario creates additional pressure on the Ontario government’s budgetary position. While other provinces see higher levels of funding for areas like infrastructure and training, Ontario must fund these to a greater extent out of its own tax base. This Mowat Note looks at how regional redistribution works in Canada through the federal government. Two thirds of the federal government’s budget each year are redistributed to provinces and territories, organizations and people through transfer payments. In the fifth paper in the Fiscal Transfers Series, Matthew Mendelsohn argues that Canada’s system of fiscal arrangements is misaligned with current economic realities.